In the late 1800s, biology was becoming a real science and profession. The discoveries of Alexander Humboldt, the publication of Darwin’s The Origin of Species, and the classification work of Jean Louis Rodolphe Agassiz had spurred interest in diversity and evolution. One place where biologists could easily access many life forms was the marine environment. At the turn of the 19thcentury, marine research stations were being set up all over the world. One of them, the Tufts Summer School of Biology, opened at Potts Point in South Harpswell on Casco Bay in 1898. The first summer, eight students and their teachers hauled seawater half a mile to a small cottage that served as laboratory and dorm. 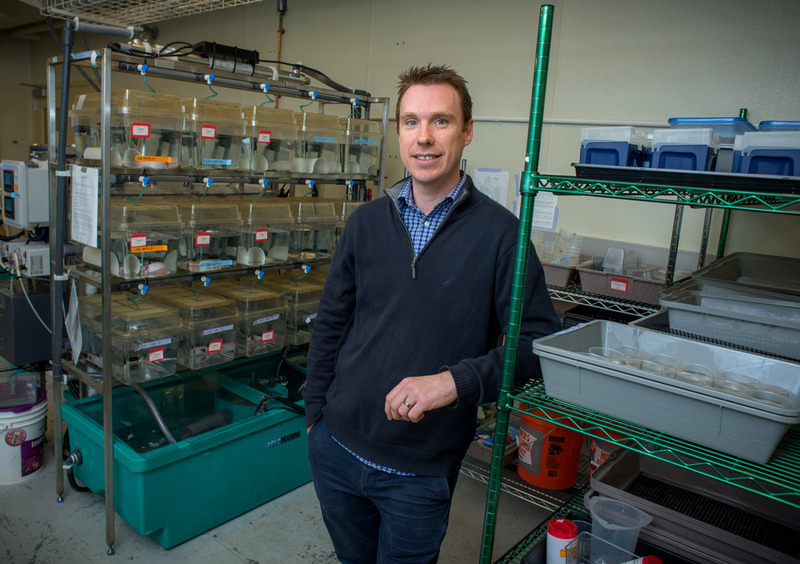 Jarod Rollins, Ph.D. at MDI Biological Laboratory, studies C.elegans, or roundworms, with the goal of understanding how life-extending interventions work across different species and applying what is learned to extend human health and longevity. In recounting the history of the lab—which became The MDI Biological Laboratory—Jerilyn Bowers, development officer, explains how the physician-scientists who arrived in the 1920s and 1930s believed that marine organisms might help them address medical challenges. Physiologist Eli Kennerly Marshall (1889-1966), for example, wanted to understand how the body could retain drugs longer and thereby increase their effectiveness. In studying the physiology of the kidney, he discovered that certain fish had less complex filtration units. His studies of goosefish, caught in nearby waters, led to a new understanding of how the kidney functions. Because the lab attracted scientists from around the world, the research was varied. One avenue of interest was environmental issues, including the effects of DDT and other toxins on fish and the impact of crude oil on sea birds. The underlying theme of the research is “finding the right model, whatever that is, to answer the question you are seeking to answer,” Bowers said. The model of doing research where scientists would pack up and go away for a summer of study started “dying very rapidly in the 1980s,” notes Kevin Strange, Ph.D., MDI Bio Lab’s president since 2009. Indeed, the lab moved to a year-round operation in 2000. And while the research facility remains by the water—fronting on Upper Frenchman Bay—its connection to the marine environment has decreased in the last 20 or so years. 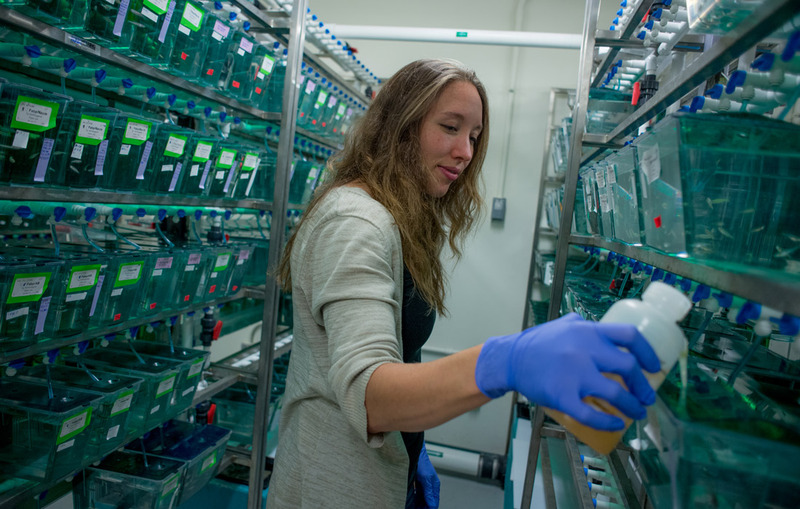 Karlee Markovich is an animal care technician at MDI Biological Laboratory’s animal facility who cares for more than 20,000 zebrafish. The setting remains important, however. “Rather than doing science in a bunker somewhere in the middle of a big city,” says Strange, the lab is “keeping people connected to the natural world,” a connection he feels has been lost in the bio-medical sciences. While biologists can still learn a great deal from marine organisms, Strange points to economic realities to explain the lab’s shift away from the sea at its doorstep. Not long after arriving at the lab, he asked his team to review all the National Institutes of Health grants using search terms related to marine organisms. Out of 35,000, they came up with 25. Faced with this state of affairs, the lab sought to diversify its revenues, in part by finding ways to commercialize its work. Many marine labs are adopting this strategy to survive. The Bigelow Laboratory for Ocean Sciences in Boothbay, for example, has taken up algae production. Its National Center for Marine Algae and Microbiota is a leading distributor of marine microalgae for science and industry. In 2013, MDI Bio Lab spun off a for-profit company, Novo Biosciences, Inc., based on a molecular chemical compound, MSI-1436. First discovered by Dr. Michael Zasloff in the dogfish shark on a visit to the lab in the 1990s, the compound has been shown to facilitate dramatic repair and hasten regeneration of complex limb tissues and heart muscle. The for-profit entity received a major NIH Small Business Innovative Research grant in 2017 to take the drug candidate to the next stage, testing for commercialization. 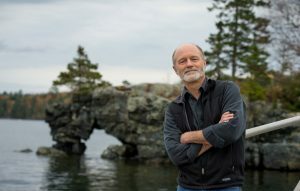 Dr. Kevin Strange, president of MDI Biological Laboratory in Bar Harbor since 2009, stands on the dock of the lab with Star Point in background. “We’re not studying stem cells,” Strange explains, “We’re studying the animals that live in nature that have phenomenal regenerative capacities.” Among those creatures are the zebrafish and the axolotl, a kind of salamander; both have the amazing capacity to regenerate lost body parts. 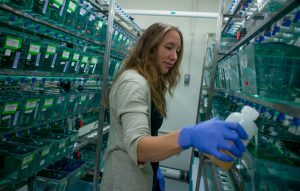 Dr. Voot Yin and other scientists at the lab have been studying these creatures to learn how regeneration works and how to trigger a similar mechanism in humans. The lab produces most of its own test animals. Animal Care Technician Karlee Markovich shows a visitor immaculate incubating facilities where the tiny creatures are raised. The animals reproduce quickly in captivity and are relatively inexpensive to house and utilize. Strange and his team remain realistic about finding a breakthrough. “If you had a heart attack and you could reduce the amount of scar tissue by 5 percent,” Strange explains, “you’d be doing handsprings.” If the new drug works, it would also have potential applications for MS, spinal cord regeneration, and burn healing. “The Laboratory is a place for study and investigation, not for teaching,” wrote George B. Dorr at its inception. But today, education is a core part of its mission. The lab prides itself on its hands-on approach, offering 30-35 courses each year, training everyone from middle-school students to practicing physicians and scientists. “It’s an important part of our economic diversification,” says Strange. James Godwin, Ph.D., who studies regenerative biology and medicine. 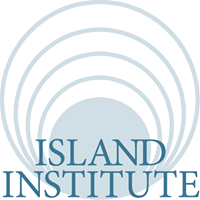 The lab enjoys close relationships with a dozen research and educational institutions across the state, including the Jackson Laboratory and College of the Atlantic on MDI. The collaboration aims to develop a technically skilled workforce through biomedical research training for undergraduates; provide research support to young faculty to increase their competitiveness for federal biomedical research grants; and improve Maine’s research infrastructure through a network of core facilities with state-of-the-art equipment. “Young people coming up now have a much broader perspective of science,” says Strange. “They’re not going to go off into an ivory tower somewhere and close the door; they want to solve problems.” The lab initiated a one-week course last summer, “Bridging Disciplines: Navigating Successful 21st Century Careers in Biomedical Science,” inspired by a couple of University of Maine students who recognized the need for cross-disciplinary training to keep their studies relevant in a rapidly changing job market. The lab has embraced the STEM movement and the increasing focus on entrepreneurship. At the same time, Senior Staff Scientist Jane Disney, Ph. D., the lab’s director of education, has been leading the effort to train citizen scientists. “We’re trying to instill a sense of place in students,” she explains, so that they return home with the tools to test and measure. “People learn better when they have something invested in the data they’re developing,” she says. The lab offers special summer programs to engage and educate visitors. For several years, it mounted exhibitions highlighting connections between art and science (last year four artists were “embedded” in the lab). He also insists that science and technology can “drive a robust economy.” He points to Maine’s “remarkable” number of R&D assets. Although the state lacks a long-term strategic plan to build on these assets, he sees no reason why it can’t be a regional leader in the field, considering its proximity to Boston. A $3 million bond issue approved by voters in 2014 allowed the lab to modernize and expand its infrastructure, which includes a new building, the Maine Center for Biomedical Innovation. One of those colliders, Aric Rogers, Ph.D. left his career as a meteorologist after seeing a special on television in the late 1990s about the genetics of aging. An aerial view of the lab’s campus. “I was fascinated by the incredible discoveries that were being made in many different animal species,” he recalls. 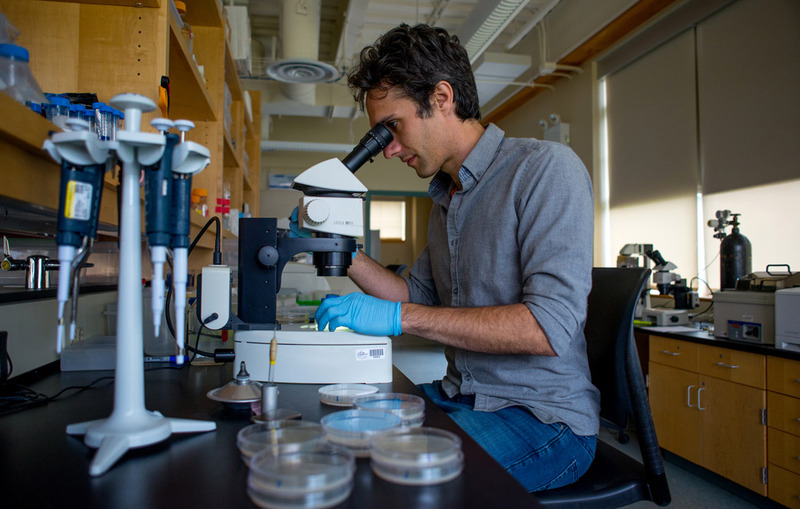 After completing post-doctorate research at the Buck Institute for Research on Aging in California, he made his way to the MDI Biological Laboratory where he works with C. elegans, a roundworm nematode the size of a grain of rice. His goal? To find new therapies that slow aging and prevent or treat age-related illnesses in humans. 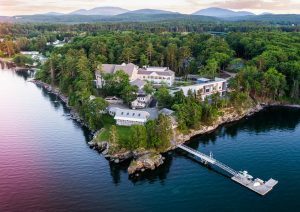 As the MDI Biological Laboratory moves further into its second century, it remains the laboratory by the sea, but its mission has expanded. With support from the NIH, the Maine Technology Institute, and other funders, the lab is now recognized as a world leader in regenerative and aging biology and medicine research. From the beginning, the lab was clear in its focus: advance human health. Its current commitment to anti-aging and regenerative strategies takes this focus to a new and exciting level. Carl Little lives and writes on Mount Desert Island. His latest books are Paintings of Portland (with his brother David) and Philip Frey: Here and Now.